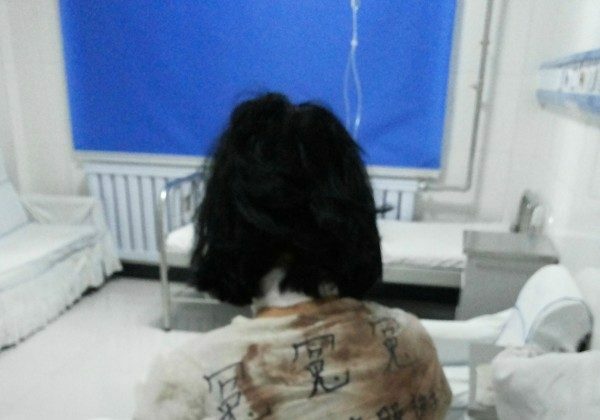 On Oct. 1, a woman made an unsuccessful suicide attempt in front of Zhongnanhai, the living quarters and offices in Beijing for the leadership of the Chinese Communist Party (CCP), to protest violent assaults by Beijing security and unfair sentencing. Oct. 1 is celebrated as the day the People’s Republic of China was founded—the day the CCP began formally ruling China. Zhang Lishuang, a resident of Heilongjiang Province in far northeastern China, arrived at the Xinhua gate of Zhongnanhai at noon, wearing a white shirt on which she had handwritten descriptions of her previous protest experiences. Her attempt to slit her own throat was stopped by armed policemen who grabbed the blade from her hands. She was subsequently taken to the Peking University Hospital for emergency treatment. In late May of this year, Zhang had gone to Beijing to petition for her brother and sister-in-law regarding employment difficulties. At that time, she was forced into a car, stripped by security officers of her clothes, and then returned to her home county, denied of food, water, and clothing for the entire 20-hour drive. When they arrived at the local authorities of Zhang’s home county, she appealed to the local officials to arrest these “underground” security officers, termed such because they are not considered legitimate officers and often attack petitioners. She even went so far as to lie down in front of their vehicle so they couldn’t leave, begging the local security officers to arrest the thuggish security guards. The local authorities would not stand up to these underground security officers, however, and on July 18 sentenced Zhang and six of her family members to 1 to 2 years of imprisonment and 1 to 4 years of probation. Translated by Virginia Wu. Written in English by Barbara Gay.